Recent studies show that shifts in the microbiome can happen in as little as 30 to 48 hrs after significant dietary alterations1. You are able to restore the health of your gut with lots of plant fibre, prebiotic fermented foods like sauerkraut and kimchi, and nutrient dense foods like leafy greens. Gastrointestinal disorders like Crohn’s, ulcerative colitis, and irritable bowel syndrome (IBS), but can also lead to autoimmune diseases like thyroid disorders, multiple sclerosis (MS), and type-1 diabetes2. So how do we cultivate a good gut environment? The most important ingredient for cultivating a good gut environment is indigestible plant fibre. It’s the preferred food of the healthy bacteria living in our gut. We should be eating foods that are high in dietary fibre, like leeks, garlic, onion, artichokes, asparagus, lentils, and oats. Fermented foods are also great because they act as a prebiotic, meaning they provide food for our gut bacteria, and the fermentation process also produces additional live bacteria. Foods like sauerkraut, kimchi and pickles contain live bacteria from the fermentation process and also lots of fibre. Fermented foods are not a new phenomenon despite all the attention they are now getting in the media. For centuries they have been used in traditional diets around the world to preserve food. Fermented foods like Kimchi and Sauerkraut are rich in probiotic bacteria which can be beneficial for digestion. They are also a good source of B vitamins! 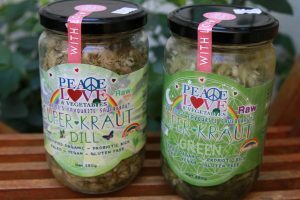 Sauerkraut and Kimchi: My absolute favourite is Peace Love and Vegetables as their ingredients are 100% organic and of the highest quality, utilizing medicinal herbs and spices as well as locally grown native Australian bush foods. You no longer need to be fearful of bacteria as they are essential in creating a healthy body and mind.